This Heart Shaped CZ Birthstone Ring is made from the finest of sterling silver and is designed for optimum beauty and maximum comfort. You no longer have to sacrifice style for comfort or comfort for style- you can have them both! This is a ring you can wear every day and be proud of. Customize your ring with your choice of up to two birthstone gemstones. The thin silver band makes this a great piece to wear with any outfit and the small stone inlays add a nice splash of color and class. Many people select this unique and gorgeous ring as a gift for those big occasions and special life events. Discover for yourself the beauty and attraction a personalized ring can bring! 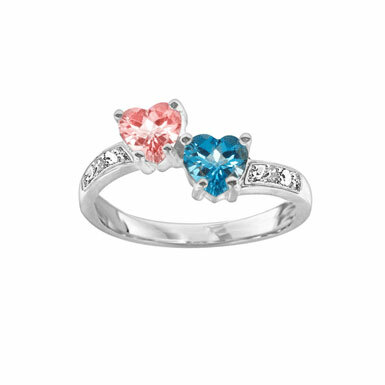 We guarantee our Heart Shaped CZ Birthstone Ring in Sterling Silver to be high quality, authentic jewelry, as described above.